Hello! I had a chance to play after work today with the CAS challenge over on SCS (splitcoaststampers). Today's challenge was to use a tag or tab on our cards. I LOVE using tags on my cards and have a pile of tags that I have die cut using my cameo just begging to be used! This also fits Friday's free for all challenge on SCS which was to use the word love (mine says loved, but I think it will qualify!) I went extremely CAS today using lots of white space with a couple pops of color. 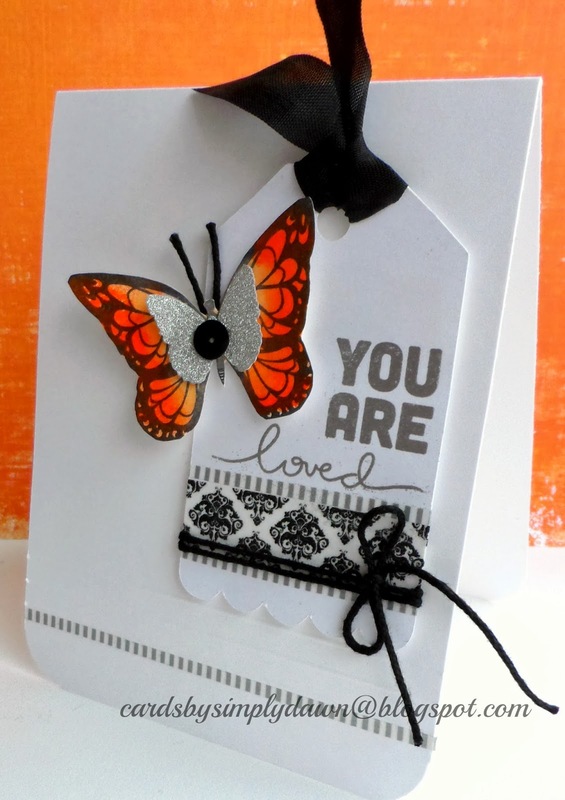 I stamped the butterfly from inkadinkado onto marshmallow cardstock using archival ink, then used gelato's to color it in. I cut it out and then added some shimmer using my wink of stella pen in clear over the entire butterfly. I added a second butterfly that I had punched out of silver pow glitter paper and popped a black sequin in the middle. The sentiment is from Februrary's card kit by Simon Says Stamp and is called thinking of you. I embossed that using silver embossing powder. I also added some fun washi tape. The skinny silver and white striped washi tape is from Little B and came in another card kit from SSS and the black and white washi tape is from my stash. I also added 3 score lines above the bottom little strip of washi tape but I don't think my camera picked it up! I love how crisp this looks in real life. I wish my photography skills were better! I checked out the challenge before I went to work this morning and couldn't wait to come home and play! Thanks for stopping by!